Richtel tells the history behind CSI tools and techniques using real-world examples from around the globe. CSI researchers are fascinating scientists, if a bit quirky. The criminals they seek are terrifying and elusive. Thus Forensics is filled with fiction-worthy characters and history lessons you didn’t learn in school. In the course of researching her best-selling books, McDermid has become familiar with many branches of forensics, and now she uncovers the history of this science and the people who make sure that for murderers, there is no hiding place. Forensic scientists can unlock the mysteries of the past and help serve justice using the messages left by a corpse, a crime scene, or the faintest of human traces. 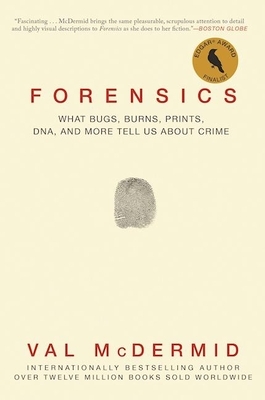 Now available in paperback, Forensics goes behind the scenes with some of these top-level professionals and their groundbreaking research, drawing on original interviews and firsthand experience on scene with top forensic scientists. Along the way, we discover how maggots collected from a corpse can help determine time of death; how a DNA trace a millionth the size of a grain of salt can be used to convict a killer; and how a team of young Argentine scientists led by a maverick American anthropologist were able to uncover the victims of a genocide. The journey takes us to war zones, fire scenes, and autopsy suites, reveals both extraordinary bravery and true wickedness, as we trace the history of forensics from its earliest beginnings to the cutting-edge science of the modern day. A former journalist and Northern Bureau Chief of a national UK tabloid, Val McDermid is the best-selling author of thirty novels, three story collections, and another non-fiction book called A Suitable Job for a Woman, an inside look at female private investigators. She has received numerous awards recognizing her exceptional career, including the Crime Writers' Association Cartier Diamond Dagger Award for outstanding achievement in the field of crime writing and the Pioneer Award from Lambda Literary. She lives in Scotland.